Hello, Well its been a slow build. Little at a time. my franken (lots of spare pieces) build now has a really low back end that im not sure how to resolve. The shocks were purchased from the site(used). I was told they were traxxas big bore shocks. Once i add the motor Castle Creations 3800KV, the back end drops. How do i correct this? The collar was already applied. collar=clip above the spring, correct?? 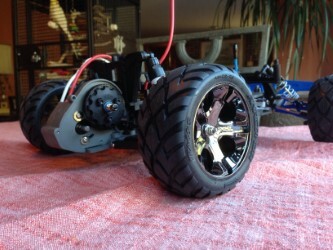 Try moving the shocks closer towards the chassis. I've always had to run them with a thick and a middle size spacer on my rustler's to keep them from sagging so bad. Could try a heavier spring if you have some. Did you check to make sure nothing is binding? 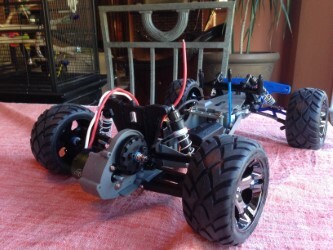 If not, I would start by removing the rear wheels, then unscrewing the shocks from the a-arms. Then check to make sure the arms fall with no resistance after you raise them. Also, make sure that the shocks pivot freely on the upper mounts at the shock tower. If nothing is binding, either add preload spacers or use a heavier spring. FWIW, it looks like the springs you're using are for a slash. They'll work, but I would ditch them for some linear springs. 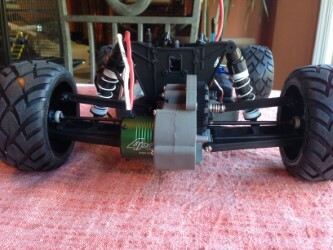 You can also throw on some stiffer springs, I think the blue Losi 2.5" rear springs will fit and are stiffer. I just looked at your pics again and noticed that it's sagging that much and there isn't even a battery in the truck. Something is definitely not right. My money is on binding in one or more of the hinge pins. How long are the rear shocks ? Im wondering if they are the shorter ones ? Hello, I just finished putting the rear back together. The orig. hinge pins were bent. 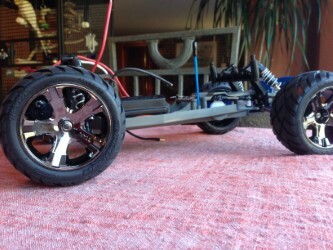 I replaced the suspension arms and hinge pins. As for the length of the shocks im not sure as I got them from a parts car. I have to check them tonight when i get home from work. Ill also look to see about replacing the springs. Thanks everyone for your help. 2 additional question. 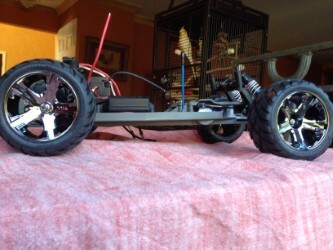 Im going to replace the rear springs on the Traxxas Big bore shocks and well as change out the oil. What are Linear springs and any suggestions on what oil i need to use for the rear shocks. Thanks again. I've always preferred the progressive springs and 35 to 40 weight oil. The stock rustler springs are linear. hello, Any specific "progressive" replacement springs i should look for? Id like to keep the Big bore shocks and swap out the springs. Morning, Any specific "progressive" replacement springs i should look for? Id like to keep the Big bore shocks and swap out the springs.